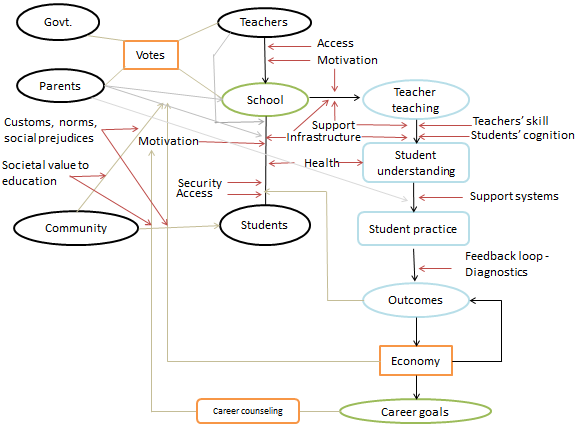 This section builds a framework for school education reform in India. In previous sections, we have discussed many issues and possible solutions, then why this? Though it is necessary to know the issues, possible approaches for solutions, it is equally important to look at all of them from a broader perspective, fitting them in to a framework. This gives us a sense of ‘why’, and help us work in the inter linkages of each. As evident, most of the individual aspects mentioned in this sections are discussed elsewhere above where context, evidence and the questions of why & how are answered there. Hence I am assuming that the reader of this section has a background of this. At times, it appears that the perennial debates on school education reform are struck in a low level and dangerous yet comfortable equilibrium. The public schools aren’t being effective and we don’t seem to have ways to fix them at least in short term but then we don’t want to rely on private schools either. We are in a comfortable situation saying – public schools don’t work and private schools don’t work. Teachers have perfect alibi systems – infrastructure, unmotivated students and parents have perfect alibi – unmotivated and irregular teachers. Any initiative to incentivize students to propel themselves is met with a criticism of pressure on students and any initiative to make teachers accountable is met with criticisms of teaching to the test etc. In contexts of weak state capacity like ours, too much autonomy can turn out to be ineffective but then any efforts to standardize certain procedures are resisted arguing that teaching students isn’t equivalent to producing goods in an assembly line. The opportunity costs of such low-level equilibrium status quo situation are higher. We obviously can’t afford it and we have to do something about it. So, what should be done about it? An obvious guess to this question is – go for a middle path. We need to mend the following approaches in our debates in order to be able to find a middle path. One, we should stop looking at everything as ‘either or’ situation. If girl students are given bicycles to increase access to secondary schools then the argument is, ‘Oh, but that doesn’t result in outcomes and nothing is being done about teacher absence or pedagogy etc’. Giving bicycles doesn’t mean that others aren’t being done. We need both. Two, we need to judge initiatives by appropriate. Just like listening to a teacher needn’t improve nutrition, giving nutritious food needn’t improve the subject knowledge. So, instead of arguing that schemes like mid-day meals don’t improve outcomes and hence are useless, one should better ask if midday meals affect enrollments or improve nutrition of children etc. When everything is a necessary condition, all of them can’t be judged by learning outcomes alone. In the absence of effects on learning outcomes, the intermediate effects are the better metrics to be judged up on. Three, we should stop looking at every initiative as possibly helping everyone. Some argue, intrinsic motivation is needed to learn through technology tools and hence can’t help every student. It’s fine if technology isn’t able to help non-intrinsically motivated students but at least it is bettering the situation of the motivated students. At least, let these kids take an advantage of it. We always keep saying that there aren’t no silver bullets but often forget when comes to judging interventions. This world isn’t in a perfectly ordered state where one intervention or product can be effective everywhere. It is inform of clusters and these products can be effective for some clusters and hence we should let these products better the condition of these clusters and not reject them because they aren’t helping every cluster. Four, instead of endlessly listing negatives of every idea or dismissing the possibility of negative effects we should acknowledge the genuine negative effects and see if there are ways to cushion them. The typical response to any new idea is to comment on, why it won’t work and the possible hurdles. These turn out to be reasons to reject the ideas. Theoretically, one can give an endless list of hurdles and negative aspects for every idea and in environment of excessive analysis and paralysis of action; it is easy to strike down every idea due to theoretical concerns, some of which may be true and some may not be. On the other hand, the proponents of the idea dismiss every possibility of a negative effect. This also fixes us in another low level dangerous equilibrium. The solution here is not to accept every idea but to intelligently categorize the concerns. In simple words, doing a cost vs. benefit analysis instead of a just cost analysis. If the idea is worth trying out, then we should acknowledge the genuine concerns and think of possible ways to cushion the negative effects instead of burying down the idea due to theoretical concerns. Hoping that this will at least resolve some part of the dead-lock and budge the status quo, let’s return to our framework. In a detailed discussion over multiple sections, we have realized that weak state capacity is the critical constraint in Indian public school system, as of today. This can be the anchor node for our reform framework. This state capacity can be again defined in several ways – the capability to implement policies, the intent to implement (having capability isn’t enough, one should also have the intent) and the much broader definition being, the capability to identify issues and address them. In whichever way we use it, our framework will be built with this as the anchor node. Recognizing that weak state capacity is one of the major hurdles. Figuring out what to do about are the next. We then discussed the concept of iterative adaptation and the necessity of focus and execution to successfully implement a policy. On focus – we discussed that when a person is overburdened with multiple tasks, then that person tends to work towards ensuring that the worse doesn’t happen (by just trouble shooting urgent issues) and not try to excel at them. In this process, some tasks which are high on the priority list from the perspective of the system can go down the priority list of the person. If this is the situation then consolidation is the first step to bring back the focus. The famous tale of the Apple Company can help us understand this better. Around 1990, Apple was on the verge of bankruptcy but then it picked up again. What has happened? There can be various possible factors responsible for this but one of the first decisions that the company took was to cut down its products. It is said that, Apple had 90 products at that point of time. It cut down its products to 5, a mere 5. This reduces burden and helps the company focus and do few things better rather than spreading oneself thin and failing at everything. Of course this doesn’t mean that one should do only limited number of things but the point is that this number should be proportional to the strength. Similarly, the first task to an overburdened bureaucracy is to cut down as Apple did. The challenge here being, Apple could cut down its products but government can’t afford to do that. Imagine if government were to say, I am consolidating and hence removing education from my responsibilities. It is still possible for government to cut down, while still obliging its responsibilities, by devoluting and seeking assistance. It means that instead of either doing itself, it can either devolute the responsibility depending on the nature of the task to the lower levels or seek external assistance and just monitor the outcomes. We have discussed a great deal about arguments about devolution and aspects that can be devolved. If one has to cut down the responsibilities of a state government, what are the concrete tasks that can be cut down which will ease significant space? - Teacher trainings, teacher transfers, recruitment (except design of paper) and procurement. Here again, we discussed the rationale behind each of these in relevant sections above. In summary - teacher trainings require iterative adaptation and hence are best at local level, instead of trying to do it centrally better to let it be done by district level, and also giving them flexibility to involve external organizations; teacher transfers and recruitment are unnecessary burden on state government, which is also causing delays and inefficiencies. On execution – We discussed that there should be long term support structures in place for successful execution of programs. This does sound like an obvious and abstract idea but it reminds me of a story by Dr. Atul Gawande. Dr. Atul Gawande is a famous public health specialist and surgeon in US and a distinguished author. He was once curious to know the percentage of surgery deaths which were because of complications about which we don’t have knowledge and the percentage of surgery deaths which were because of errors, the ones for which we had the knowledge but couldn’t handle it. Surprisingly, he found that 2/3rds of the surgery deaths were due to errors and that was an astonishingly high number. He figured out that having a simple checklist of things to be done in a surgical room can be an effective way to reduce these deaths. Their team piloted it in several places, publicized it and it was implemented in several hospitals across countries. He particularly notes the experience of Canada and Scotland about its effectiveness. In Canada, it was mandated to have this checklist and all hospitals agreed to it but then there was no reduction of deaths after 3 months. The sad part in education is that we don’t even have such data to track the effectiveness of interventions. While, there was a significant reduction in Scotland. He notes that while the regulation was there on paper, there were no proper implementation support systems. What does that mean? In Scotland, there were team of professionals, who would regularly visit hospitals, ask their difficulties in adhering to the checklist, coach them accordingly and it took them 3 years to bring the cultural change of just adhering to check lists. This is the type of long term commitment, focus and support needed, which is broadly called execution. In simple words, figuring out how to do may be as difficult as figuring out what to do. Devolution and seeking assistance give space to execute and the long term commitment and support helps in execution. The question over execution is bit ironical. On hand, we say that we have a weak state capacity, meaning that we have weak capacity to execute policies. On the other hand, we say that we need to execute. How do we reconcile this dilemma? The first part of the answer to this question, cutting down to create space for focus, is already discussed. The second part of the answer is, to just execute, as surprising as it sounds. This is similar to the question of, how do we make a person who is not being able to walk (due to a recoverable injury) to stand up and walk again? – By setting small goals and a continuous practice to achieve them, thereby building the capacity to walk. We need to use a similar approach here too – pick up limited number of aspects, focus and ensure that they are implemented well. This is helpful in two ways. One, when one involves people in executing something seriously and make it a success, it breaks the lethargy cycle if any and also builds confidence, capability and skills in the system to face and address the issues common to execution across different problems. The next logical question is - what are those issues that can be picked up to be executed? 1. Address problems as perceived by teacher problems in a time bound manner – The first part of the strategy to reform school education should be to bring teachers on board, consider them as partners in the reform process. Addressing the problems as perceived by teachers can be a good way to bring them on board. When one visits a school and teacher narrates a list of their problems and shows proof to some of those, it is hard to deny those realities. It is hard to tell them in that context that they should be accountable for the results. It is also hard to also make statements like, evidence doesn’t say that improving PTR necessarily improve outcomes. Some of these concerns may be true and some of which may be false and some of which may look as constraints now but there might not be effect even after resolving those. So, the first priority should to be to address these. How to address this? The first step obviously is to make a list of their problems by asking them. We don’t know the last time teachers were asked about their problems and were solved. Devolve some of the responsibilities to districts so that they don’t blame state government for everything and then resolve others in a time bound manner. This ensures that teachers feel empowered that their concerns are being listened. The immediate results may not show up in evaluations but is essential and along with other interventions can help in achieving the goals. This may be a technical reform but a reform strategy. 2. Credible assessment systems – We discussed the importance of assessments at a systemic level (not for classroom purposes) several times in earlier sections. In summary - One, when systems approach towards diversity or decentralization, monitoring outcomes becomes essential. Two, assessments bridge the information asymmetries in education. Three, assessments also signal expectations of system from the schools and students. Four, credible assessments are crucial in initiatives like teacher incentives and school certifications. There is one other important reason for the availability of student level quality assessment data – keeping track of progress and assessing the results of interventions. For example, RtE (2009) mandates 25% reservation for kids of low income communities in private schools. Do we if it has helped these kids? One credible way to test this could be to measure the outcomes of students in the school that these kids might have gone to if not for this private school and compare it with their scores. Subjected to certain caveats, this can give us some useful information. Today, if one wants to do that, it is not possible unless one goes through the painful process of securing permissions and administering these tests. Many state boards today don’t have the necessary capacity to build such credible scientific assessments and analyze them. State governments should invest in this and ensure that high quality teams are built around this. Administering these assessments also needs capacity and has to be worked upon. 3. Efficient systems for fund flow and improving process efficiency– We discussed the process efficiencies as shown by PAISA studies and the delays in fund flows. These are process level issues, addressing which is a different type of challenge but quite doable. 4. Monitor outcomes - Developing systems for monitoring the performance of districts. Initially simple goals of basic numeracy and literacy for all students of grade 2 (let’s say) should be set and ensure that it happens, monitored appropriately through credible assessments. We can then move to higher aspects later. 5. Designing defaults – We discussed that in the initial stages of devolution, there should be some default prescribed practices which can act as backups when the lower levels still don’t have the capacity to design or execute. This can be across the other themes, assessments, pedagogy etc. 6. Teacher education – Pre- service teacher education and also institutes for in-service training are very crucial for capacity building of teachers. Government can ensure their quality by either appropriately regulating them, prescribing certain reasonable standards, helping them build capacity etc. 7. Aspects of pedagogy that need attention – We discussed several aspects of pedagogy that need attention, in the theme on pedagogy – curriculum – assessments; ways to translate abstract ideas like teaching to the level of kid to instructional practices, pedagogy research and support required for assessments and so on. 8. Designing standards for regulation and iterating them - Standards for schools and teacher training institutes. 9. Curriculum design - Ensuring that the curriculum is appropriate as per both the needs and capacity of the system. 10. Creating vision - Setting up broad long term vision considering the changes in society and advancements in technology, and incorporating them into the existing requirements. It might seem that there is lot of abstractness in the above ideas but the necessary details of many of these are discussed in the relevant sections in this book. Also, part of the challenge of strengthening the state capacity is to deal with such abstractness. Till now we discussed the aspects that can be cut down to ease space for focus and aspects that can be used as anchors to practice the skill of execution thereby building the state capacity. Apart from these, there are some specific aspects or constraints that are to be addressed. We already discussed the detailed regarding these in earlier sections. They are – (i) shift focus from time-bound completion of syllabus; (ii) teach to the right level of the kid; (iii) after-school support systems; (iv) reform board examinations; (v) allow for-profit private schools; and (vi) training teachers of low-cost private schools. The first two aspects overlap with the curriculum design and monitoring mechanisms discussed as part of the 10 points above. School Choice or Voucher program is the remaining issue in this category. The relevant section on school choice details its nuances and suggests way forward. One may settle for the alternative measures of ensuring competition by legalizing for-profit schools, building capacity of low-income private schools and so on but the discontent towards public schools is brewing. We discussed in the section on inert-volcanic-agitated systems framework that traditionally crisis and anchor items were reasons for moving from one state to the other, and that there aren’t many anchor items in education. If neglected, the discontent regarding public schools and demand for their rights manifested in form of vouchers can turn out to be the anchor agenda. These issues may not seem visible in normal situations, like the case of reservations but once they break out, it’s difficult to manage. It just needs an appropriate time and a person to mobilize public. Hence, one should be aware and cautious about it. We have discussed about state governments and district administration but didn’t talk much about the union government. As discussed in the section on reference frames of debates, role of appropriate government is one of the confusions in the policy discourses. Though there might be an agreement about the need to do a certain thing, one may not agree on the implementing agency – should it be done by the union government or state government or district administration or be left for society to take care of it? We have noted that weak state capacity is the critical constraint, which is best dealt locally. However, there are two important aspects that the union government should/can do apart from setting the broader vision for education and certain aspects of curriculum. One, set the tone of education discourse in the country - The union government should steer the education discourse towards learning outcomes, and create an atmosphere where education is valued in society. Increasing the societal value of education could possibly reduce dropouts, especially in the case of girls and marginalized communities. Two, participating in international assessments - Countries like Poland took the PISA results in a positive spirit and are striving to improve, while India opted out of PISA, serving no good. Participating in such assessments gives us a clear benchmark of where we are, where to reach, and how we are progressing over time. Three, ensure public access to quality data. Young Lives study conducted by the University of Oxford recently pointed to a decrease in learning outcomes of children. Similar trends were also pointed out by ASER. There is currently little raw, longitudinal data on the learning outcomes of children in India, available to public, to explore the root causes of such serious issues. Some states get third party learning assessments done, but the data is either not public or is scattered across. The Union government should take an initiative to coordinate and collate quality data on learning outcomes from across the states, and make it available to the public. This enables policy makers to make an informed choice. Four, monitor outcomes – We have discussed a great deal about the need for devolution and letting states take care of school education but what there aren’t enough efforts from some states. We can’t let it be based on principles. This might need some external prodding from union government in assisting them to achieve their goals. Five, set role models – In many aspects like quality of board examinations, curriculum design etc. union government can set role models by implementing them in contexts where it has powers to do so (CBSE exams, NCERT textbooks); it can also create a repository of best practices and inspire states to follow the lead. Finally, few words of caution. One, School education is a complex issue and the above mentioned aspects aren’t the only ones that have to be done. Only the macro aspects fitting into the broader framework are discussed here. One is always welcome to innovate. Two, these are the things that need to be done as per the evidence and experience that we have till now. Even after we do all this, we may figure out new challenges and still fall short of reaching our end goal. When one puts enormous efforts it is easy to get carried away and take these efforts as proxy for increase in outcomes, which needn’t be the case. Regular assessments will help us to keep this in check. We must remember that ticking off the boxes in the above check list isn’t the final goal, ensuring learning outcomes is and hence the strategies can be adapted as we learn new lessons but these can definitely be the starting point for reform. Three, we need to realize that we still don't know answers to many questions. I feel one of the common instincts of many, including me is to feel that we know the answer, or have an opinion, because dealing with uncertainty of not knowing about something for long periods of time is tiring. This may either hinder further exploration of truth or end up having incomplete conceptions, both of which aren't desirable. While we do all of these, we should remember that we still don't understand many aspects and be open to learn.